Butter vs. Margarine: Which One Is Better? Home » Food and Nutrition » Butter vs. Margarine: Which One Is Better? When it comes to the debate of butter vs. margarine, there is a lot of controversy over which is healthier. There are many uses for both of these products. Both butter and margarine are commonly used as spreads for bread. Butter and margarine can also be used for cooking and baking, as well as added to soups and a variety of other meals. So which one is the healthier option? There are plenty of health experts, doctors, and health-conscious people who claim that one is good and the other is horrible. Many years ago, health experts suggested that butter was bad for our health, and recommended margarine as the healthier alternative. But since then, it’s been suggested that margarine, which is heavily processed and based off of vegetable oil, is actually less healthy than butter, which is an all-natural dairy product. So how to decide? If you want to know which one is healthier, then it’s important to look at some butter vs. margarine facts. If you take a brief look at the nutritional values of butter and margarine, you may not think that there’s much of a difference between the two. Both butter and margarine have similar amounts of calories, fat, and water; in fact, both contain roughly 80 percent fat content and 16 percent water content. However, while butter and margarine have similar amounts of total fat, there are differences in the types of fat they have. Butter is higher in saturated fat, while margarine is higher in trans fat. So butter is higher in different types of fat than margarine is, but what does that mean? There are several key differences between butter and margarine. Butter is an all-natural dairy product that’s been around much longer than margarine. To make butter, cow’s milk is shaken or agitated or churned until the fats separate from the liquid, which eventually results in butter. There are a few more steps involved, but that’s basically how it’s done. Some butter products have a few additives (such as salt or sometimes herbs) added to them. Margarine, on the other hand, is a man-made, highly processed product made from vegetable oil. Margarine was created in 1869 in France as a replacement for butter for soldiers and the lower classes, as butter was expensive. This means that margarine is similar in taste, appearance, and consistency to butter, but these similarities are achieved by adding a variety of artificial ingredients to margarine, including emulsifiers and artificial coloring. As well, margarine is put through a process of hydrogenation, which extends its shelf-life but also increases its trans fat content. So, to sum up: the main difference between butter and margarine is that one is all-natural and one is highly processed. They both have similar amounts of calories, fat, and protein, but margarine has more trans fat, while butter has higher saturated fat and cholesterol. In the past, it was believed that saturated fat and cholesterol were bad for you, but research now suggests that they may not be as unhealthy as previously thought. When it comes to the butter vs. margarine difference, it may surprise you as to which food is worse for your heart health: it’s margarine, because of its trans fat content. Trans fats have been linked to heart disease, and margarine also contains other ingredients that may lead to cancer, heart disease, and other ailments. Originally, margarine was considered healthier because it was believed that butter was bad for heart health as a result of its saturated fats and cholesterol; both of which are high in butter. The fats and cholesterol was thought to raise people’s cholesterol levels, which in turn raises their risk of heart disease. However, there are two types of cholesterol: one that’s good for us and one that’s bad. Research has since found that saturated fat and dietary cholesterol raise HDL cholesterol (the “good” one, which isn’t linked with heart disease), and that they don’t raise LDL cholesterol (the “bad” one). Instead, they actually improve LDL, making it more benign and less harmful. This means that the saturated fat in butter does not increase the risk of heart disease, and many studies have confirmed this. Trans fat, on the other hand, is very high in margarine, and it’s been linked to heart disease. What’s frightening is that margarine can be labeled “trans-fat free” as long as the trans fat content is below a certain threshold, meaning that you may still be eating some of these unhealthy fats even if your margarine container claims to have none. Furthermore, margarine is made from vegetable oil, which is high in polyunsaturated fat. This type of fat has been linked to cancer, violent behavior, and cardiovascular disease, making it a very unhealthy dietary choice. You may eat margarine because you believe that butter is worse for your heart, but you may actually be doing more harm than good. Butter vs. Margarine: Which Is Better for You? 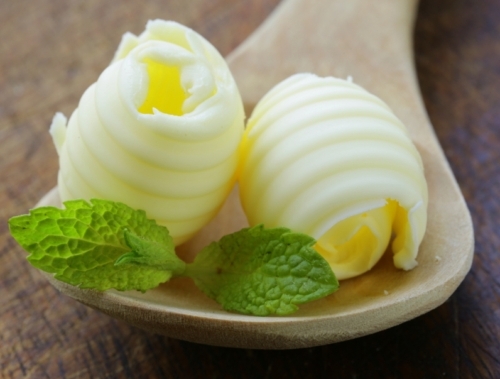 So between margarine vs. butter, which is better for you? Even if margarine is worse for your heart, are the other ways in which it’s healthier than butter? Whether you choose butter or margarine, it’s important to note that both contain a high amount of calories. One tablespoon of butter has 100 calories, and margarine has a similar amount. Adding, say, a stick of butter to your meal greatly increases the calories and fat, and too much of either is unhealthy. While many people believe that fat is bad for health, the truth is that our bodies need some fat to function. Butter, in moderation, can be an important and healthy source of fat, but don’t go overboard—stick to the recommended amount of fat intake per day. Conversely, trans fats are never a good source of fats. While some margarines do have limited amounts of trans fat, they are still highly processed and contain a number of additives, artificial coloring, and emulsifiers that can make them less than healthy. On the other hand, many brands of margarine also have added vitamins, omega-3 fatty acids, and other healthy ingredients. Margarine can be a healthy choice too, as long as you choose brands that are free of trans fats—and of course, don’t eat too much. So, now you know the differences between margarine and butter: butter is all-natural, while margarine is processed, and margarine can contain a variety of additives, including—if you can believe this—butter. It’s a funny thing: even if you’re eating margarine, you may be eating some butter too. However, putting health aside, what other differences are there between the two? Margarine is made to look and taste like butter, but does it really taste like butter? Well, when it comes to flavor, most people still prefer butter. Butter is a richer in taste; it’s simply more flavorful. The taste of margarine, on the other hand, varies from brand to brand. Some brands of margarine taste better than others, but very few can completely match the taste of butter. Many people who have switched to margarine say that it takes a little while to get used to it. What about choosing between butter and margarine for cooking, or butter and margarine for baking? Are they both as easy to use? When it comes to cooking or baking, butter has a different texture than margarine. Butter is very creamy and rich, while margarine can have a lighter, less creamy texture. For baking cakes or other meals, using butter can add some creaminess to the meal. Though margarine does work great as a spread, due to its light texture. The bottom line is, if you eat margarine, you will not mistake it for butter. Margarine is definitely not butter, but it may be close enough for you, depending on the brand and your individual needs. Now that you have more information, you can choose between butter and margarine. While margarine used to be considered healthier, it’s now believed that butter is the healthier choice. You will find health experts on both sides of the debate, but research has shown that saturated fat and dietary cholesterol aren’t as bad as previously believed. So if you want to go with the healthiest choice, stick with butter. That said, eating too much butter still isn’t good for you. In fact, a little bit of margarine is probably healthier than two whole sticks of butter, so remember to always eat in moderation and choose brands that are low in trans fats, as these will be healthier. If you don’t like the taste of margarine at first, you can always try a few different brands. Ultimately, with both butter and margarine, how healthy they are comes down to how much you eat. We need some fat in our diets for our bodies to function properly, but too much is bad for us. Butter is one great source of healthy fats. While there was a lot of paranoia and fear in the past about butter, spreading a little bit on your bread can be a healthy choice. Gunnars, Kris, “Butters vs Margarine – Why I Trust Cows More than Chemists,” Authority Nutrition web site, May 2013; https://authoritynutrition.com/butter-vs-margarine/, last accessed April 21, 2016. MacMillan, Amanda, “Butter vs Margarine: How to Choose,” Health web site; http://www.health.com/health/gallery/0,,20509217,00.html, last accessed April 21, 2016. Zeratsky, Katherine, “Which Spread Is Better for My Heart – Butter or Margarine?” Mayo Clinic, May 14, 2015, http://www.mayoclinic.org/healthy-lifestyle/nutrition-and-healthy-eating/expert-answers/butter-vs-margarine/faq-20058152, last accessed April 21, 2016.